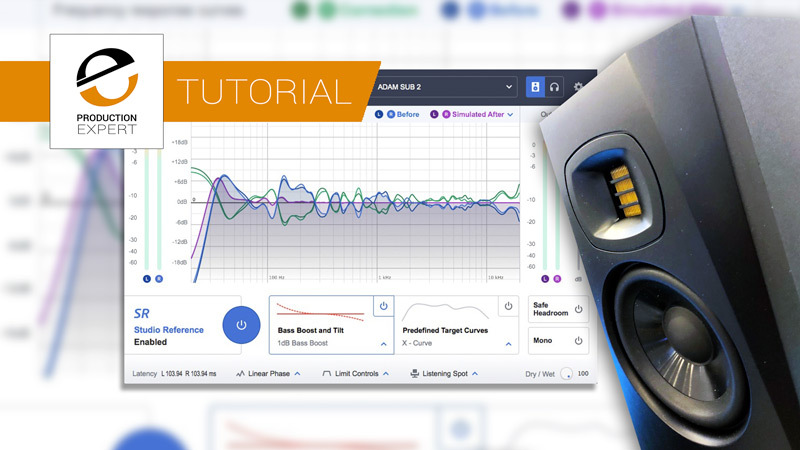 Production Expert | Are Your Studio Monitors Lying To You And Can You Trust Sonarworks Reference 4 To Fix Speaker Issues? The frequency response graphs you see in studio monitors specs will tell you what a speaker will be like in ideal conditions, as typically it will be the results of measurements taken in an anechoic chamber, a special room without reflections. The vast majority of modern studio monitors these days reproduce fairly flat “neutral” frequency response curves, when in an ideal room. Even some small budget monitors are capable of some close to flat responses which is great news for people starting out. However because these frequency response curves are measured in an ideal space, they don’t tell us how the speakers will perform in the less than ideal spaces most of us have. Let’s say you purchased a set of new studio monitors based on its advertised near flat frequency response. You setup these monitors in a modest sized bedroom studio and you find that you are happy with the mixes you produce, until you test your work on other systems outside of your studio in the car or a different space. What’s happening here? The manufacturers spec promised a flat frequency response, so why does my mix have perfect bass in my studio yet sound thin and lifeless in other environments? This is the scenario that many people starting out come up against time and time again. The issue here is that the speakers cannot work in isolation from the environment they are placed in. The room will affect the sound and tonal balance produced by the speakers. To resolve this it is important to understand how room acoustics interact and interfere with the performance of studio monitors. These are important steps to take and shouldn’t be overlooked. These can make a huge difference to the sound coming out of your speakers and by doing this, you are doing all you can to make your studio space the best it can be within the constraints of budget and practicalities. Once you at that point, and not before, then you can look at employing some software intervention in the form of speaker calibration. But please do not think you can bypass the acoustic treatment and speaker placement and go straight for speaker calibration. Speaker calibration works best when the room your monitors are in the best it can be. The speaker calibration product of choice for me is Sonarworks Reference 4. I’ve been using it for over four years. I have not mixed a single track without it. I won’t work without it, it’s that important and integral to my workflow. A number of other team members also use Sonarworks. Mike uses a hardware and software solution with a miniDSP hardware unit with Dirac Live software for his 5.1 surround monitoring system. James uses a Trinnov hardware system for his stereo monitoring in his studio. In this video we show you everything you need to know about Sonarworks Reference 4, how it works, how you can easily harness its power to improve your workflow along with a guided tour of the application explaining each of Reference 4’s curves. Learn why thousands of audio engineers worldwide love and trust this amazing system in their daily studio workflows.